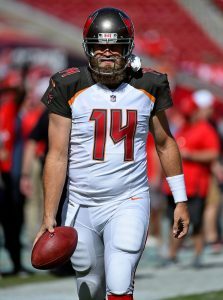 The Dolphins have signed quarterback Ryan Fitzpatrick, according to Cameron Wolfe of ESPN.com (Twitter link). It’s a two-year, $11MM deal that could reach $17-20MM via incentives, tweets Adam Schefter of ESPN.com. Miami traded former starter Ryan Tannehill and a 2019 seventh-round pick to the Titans on Friday, acquiring a 2019 sixth-rounder and a 2020 fourth-round pick while absorbing $5MM of Tannehill’s $7MM 2019 base salary. That left the Dolphins will only two quarterbacks on its roster: former sixth-rounders Jake Rudock and Luke Falk, who have combined to attempt five passes in the NFL (all by Rudock). Fitzpatrick was the best signal-caller still available on the open market, especially after the Dolphins reportedly tried — and failed — to land both Tyrod Taylor and Teddy Bridgewater. Taylor opted to sign a two-year to backup Philip Rivers with the Chargers, while Bridgewater decided to return to New Orleans on a one-year, fully guaranteed $7.25MM contract. Fitzpatrick excelled — at times — with the Buccaneers in 2018, but after what was an uneven overall campaign, Tampa Bay indicated it would deploy Jameis Winston as its full-time starter for the upcoming season. Ever mercurial, Fitzpatrick started the first three games of the year while Winston was on suspension, and tossed 11 touchdowns against four interceptions while completing more than 70% of his passes. Things unraveled against a league-best Bears defense in Week 4, and Fitzpatrick lost his job to Winston. The 36-year-old Fitzpatrick relieved a struggling Winston in Week 7 versus the Bengals and threw four touchdowns the following week, but after five total interceptions in Weeks 9-10, Fitzpatrick was permanently demoted. All told, Fitzpatrick finished the year having completed 66.7% of his passes for 2,366 yards, 17 touchdowns, and 12 picks. The addition of Fitzpatrick shouldn’t preclude the Dolphins from selecting a quarterback early in the 2019 draft, but it’s unclear if they plan to do so. Miami is embarking on a full-scale rebuild, so the club may attempt to bottom out this season in an effort to compile more long-term assets. Miami already had Fitzmagic. Even trademarked it. wonder if the Dolphins will try to get a DeSean type to pair him with. The two worked quite well last year. Here’s what I don’t get everyone is on the “tank for Tua” when there’s only really been 2 successful left handed QBs since around the 90s, Young and Vick but god forbid Murray be a little short. I love Fitzmagic as much as the next guy but if you really are tanking why wouldn’t you just stick with Tannehill?? Tannehill is good enough to every year get that same 13-16 pick. With Fitz you’ll either get a very high pick or a mid 1st round. After playing in Buffalo and North NJ I dont blame him for never leaving Florida. This will be Fitzy’s 8th team. I wonder how many other QB’s have 30,000+ yards while playing for 8+ teams? Should have gone with Blake Bortles. He knows how to properly tank. FitzMagic will have great games and stinkers in equal measure and get you 7 wins. Bortles can lead you to a 2 win season that you will need to get the 1st pick in the draft. A parade….green beer….Fitzmagic. It’s a great day to be Irish!